Last night I visited the Pucciarella winery in the village of Villa near Magione. I went as past of a group studying for the first level of the Italian Sommelier’s Association and we were given an in depth tour of the cellar. Magione is a small town close the the north east shore of Lake Trasimeno and the Pucciarella winery makes several wines under the Colli del Trasimeno DOC. 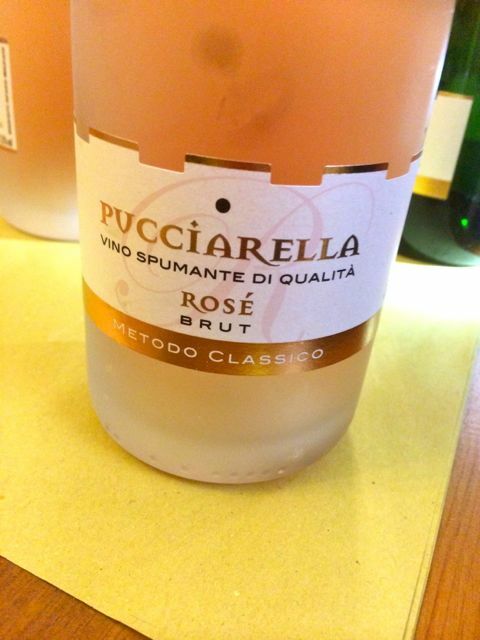 I’ve come across the wines from Pucciarella before and always been impressed with the quality of the wine compared to the price, they make a fairly wide range of wines including two champagne method sparkling wines and a vin santo. 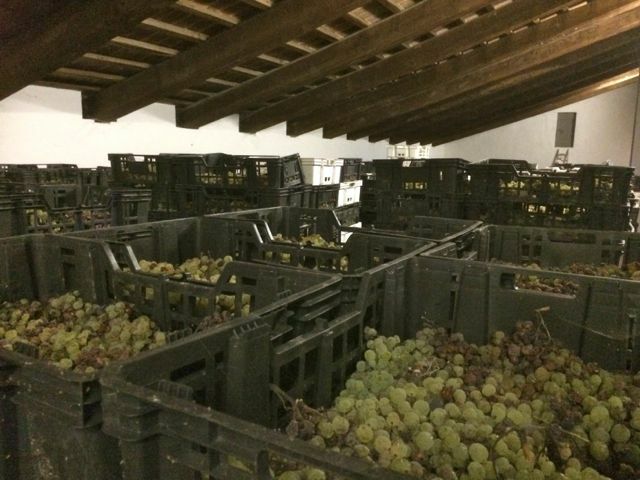 We were shown grapes drying out indoors to concentrate the sugar, this process is used to make make a sweet wine, vin santo. When I’ve seen this process at other wineries the grapes are laid out on bamboo matting lad out on stacked metal frames. Here a different method is used, the grapes are left in the plastic crates that they were picked in and these are directly stacked on top of each other. 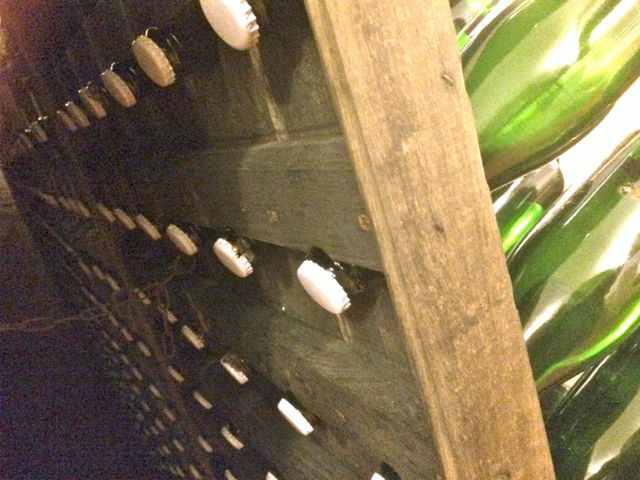 We spent a while in the cellar looking mainly at the racks used to store the champagne method sparkling wines. While the secondary fermentation that produces the bubbles is underway, the bottles are held upside down by the rack at an angle of maybe 45º off vertical, every so often they are partially rotated and the yeast slowly spirals down into the neck. While kept like this the bottles are capped with crown corks. This prolonged contact with the yeast adds flavor to the wine and gives the aroma of biscuits and freshly baked bread that is commonly associated with champagne method wines. when it is time to remove the yeast, a machine is used that rapidly freezes the neck of the bottle, the crown cork removed and the frozen plug containing the yeast deposit is forced out by the pressure of the bubbles. The missing liquid is topped up and the bottle is then sealed with a Champagne type cork. The exact composition of the topping up liquid used is always a secret as this is the last chance the wine maker has to influence the flavor of the wine. Then, it was time for the important part of the evening, the wine tasting. 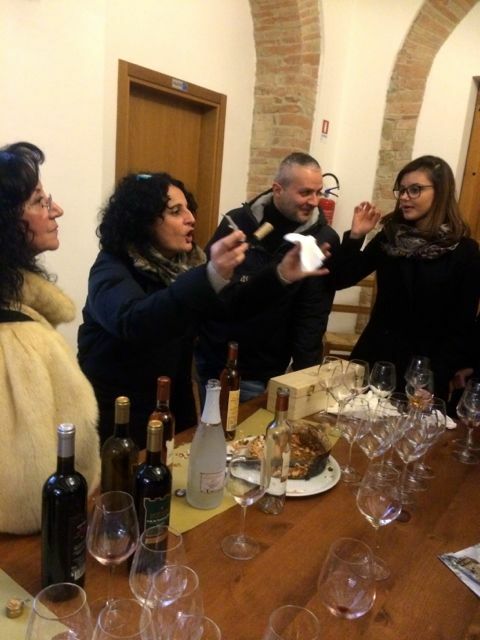 We tried both sparkling wines, one made from Chardonnay and the other from Pinot Nero, a still white made from Chardonnay, a couple of reds and the vin santo. Once again, I came way thinking that these wines offer exceptional value for money, they were all under €10.